Designates a spot where marriage ceremonies will take place. Spectators can watch from either side. 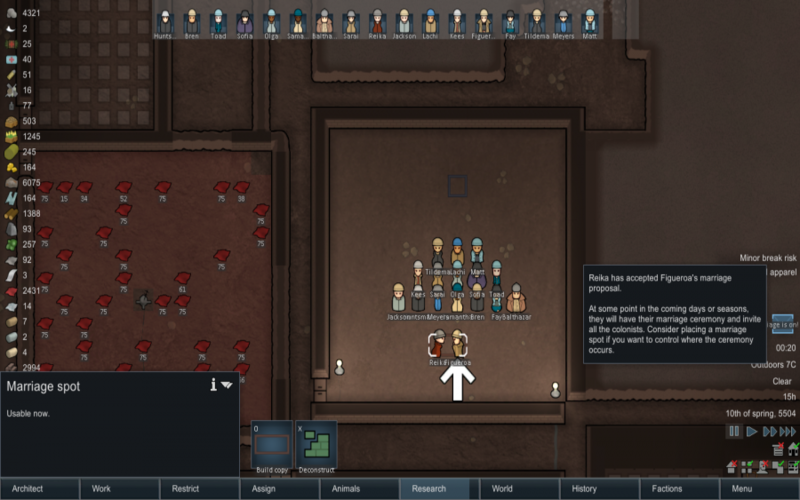 A marriage spot decides where colonists will hold their marriage ceremony. During the ceremony, the married couple will stand on the spot. Other colonists will watch the couple from a distance. Attendance can also be arranged their location when placing dining chairs. If you happen to be playing with 5 colonies at once and they are not a day long apart from the ceremony taking place, it`s possible to hold the event until everybody makes it to attendance by holding one of the two drafted outside of the room. This page was last edited on 18 June 2017, at 15:31.